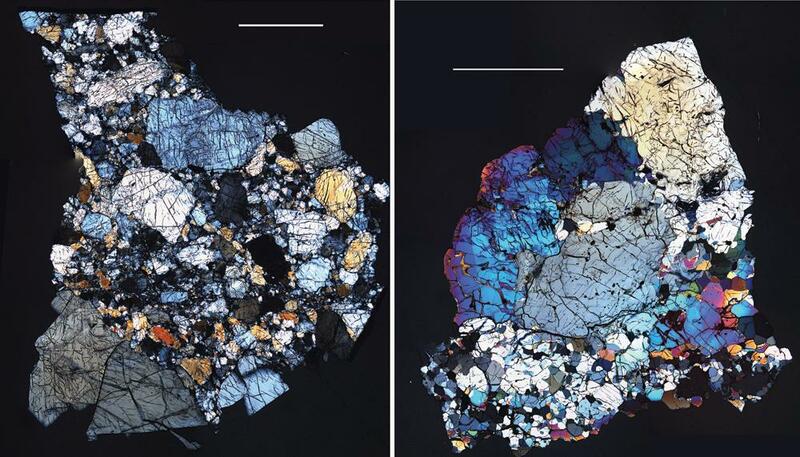 Explanation: These colorful images are of thin slices of meteorites viewed through a polarizing microscope. Part of the group classified as HED meteorites for their mineral content (Howardite, Eucrite, Diogenite), they likely fell to Earth from 4 Vesta, the mainbelt asteroid currently being explored by NASA's Dawn spacecraft. Why are they thought to be from Vesta? Because the HED meteorites have visible and infrared spectra that match the spectrum of that small world. The hypothesis of their origin on Vesta is also consistent with data from Dawn's ongoing observations. Excavated by impacts, the diogenites shown here would have originated deep within the crust of Vesta. Similar rocks are also found in the lower crust of planet Earth. A sample scale is indicated by the white bars, each 2 millimeters long.